This absolutely sensational debut novel by this very promising new author is a real tour de force! Really red hot, a real page-turner! I read it in three sessions, as it's one of the best first books of a British author, that I've read in a very long time. Former Marine James Bishop is locked up in prison for a crime he did not commit: the murder of three people. After over three long tedious years inside he has an opportunity to escape and he grabs it with both hands. Once outside - and this all is happening in and around New York City - he uses all of his contacts to prove his innocence. He was originally leader of an elite close protection team hired to protect a millionaire and his daughter. Whilst on this one particular job Bishop had been drugged unconscious and when he came around he discovered that the people that he and his team were guarding had been killed and some of his associate team also - in all seven bodies were discovered in the building. Unfortunately there was a huge amount of circumstantial evidence including large payments credited to Bishop's personal bank account that persuaded the jury at his trial that he was guilty. The author has plotted this novel very cleverly and there is just no let up in the tension as we accompany Bishop in his search for the clues that will get him off the hook and all the while there is a countrywide manhunt for him. Bishop was given the address of a contact by a fellow convict and he goes heavily disguised to the location after he obtains $5,000 of his own money from a secret location at a deceased parent's house. The contact is a man who is adept at producing forged papers as Bishop will need a fresh passport, credit card, driving license and social security number in a new identity if he is to blend into society and survive. Bishop meets the sister of the forger and is attracted to Jenna and she forms the love interest of the story. Bishop does not know who set him up and framed him for the murders or why and all he can do is check out the other members of his team that survived the killings and discover their whereabouts. 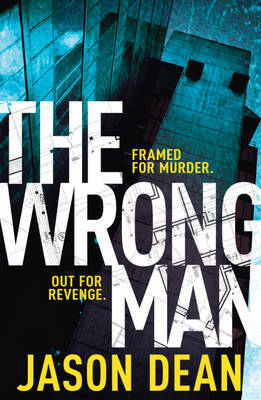 The wrong man has been framed for murder and he is out for revenge. In this multi layered thriller we read also about some other characters who are shadowing Bishop and Jenna for other purposes as they believe that the two will eventually uncover clues which will lead to untold riches later. The story is very fast moving and it seems to get faster the deeper in that you read, until it takes off almost like a rocket. I thought that this was an absolutely scorcher of a book. Very well plotted and whilst not terribly long, so exciting I did not want to put it down. Jason Dean writes a very fast action packed thriller and the formula he uses is perfect for many more such thrillers. Although I thought the plot a little weak in tiny parts, it moved like an express train until its finale. Quite a page turner and I'll look out for his next one – which was previewed at the end of this one - but I'll have to wait until next year to read it which is a great pity. Well recommended.